This recipe's main ingredient is one of our favorite seafood: octopus! Octopus is cooked in various ways in Greece, and is one of the country's most popular seafood. It's also considered a great mezes (starter/side dish). Octopus is very popular in all the Mediterranean countries but also in many South and Eastern Asian countries, with Korea and Japan standing out as the highest fans. It may look a bit strange to some North Europeans or Americans as a food, but once you try a well prepared octopus, you’ll definitely love it. Perhaps a Mediterranean recipe, where the octopus is always chopped in small pieces and is thoroughly cooked, is a good start to try this delicious seafood. Those of you who never had octopus, don't feel intimidated, the taste it's not very strong, like the one of fish, but a rather milder one, enhanced by the spices and herbs used in its cooking. The usual way of having octopus in Greece is roasted/grilled, served with vinegar and olive oil, accompanied by a glass of ouzo with ice! It's consumed in large quantities during the summer and the period before Easter (fasting), but it's also served all year long. In this recipe, we suggest another way of having octopus, cooked with chopped onions and tomato sauce. 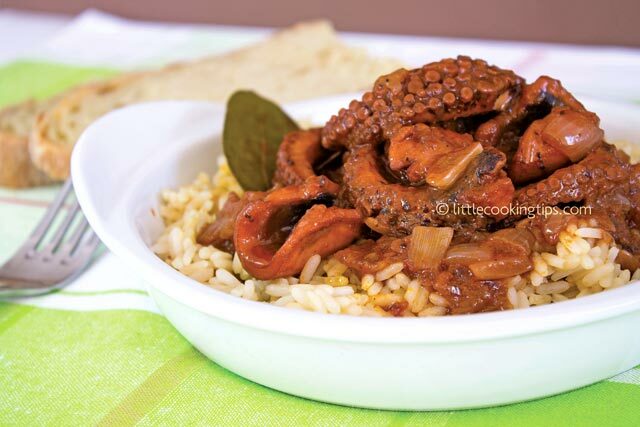 It's similar to htapodi stifado (Greek octopus onion stew), and it's more of a home cooked meal. The spices used are the ones present in most of the Greek stifado (stew) recipes, and they are a classic combination of bay leaves, allspice berries and cloves. The recipe is originated from the Aegean islands, where octopus is very popular. The scene of a seaside tavern with octopus hanging in front to dry is quite common in almost all of the Greek islands. We tried the tomato stew version of Syros island in the past, which was very tasty and we wanted to present you a similar and yet quite different recipe. We combined the sweetness of cooked chopped onions with the aroma of Greek stew spices in a beautiful thick tomato sauce and served it with long grain rice, which is our favorite way of having this food. For this recipe we used small octopus (“baby” octopus), which is very affordable and is also cooked faster than larger ones, creating a very tender result. Baby octopus is called "moshioi" in Greece and it's about 15-20cm long from the top of the sack to the tips of the arms. You can use fresh or frozen octopus. The frozen small octopus is easier to find, and it's available all year long. Frozen octopus is always clean. The fresh one, must be prepared (cleaned) by your fish store. We will show you how to cut the octopus in the Preparation section of the recipe, it’s very easy. When cooking octopus in a pot, it's important to remember that you need to give it some time. The more you cook it (in slow simmering), the softer it gets (more tender). So let's start cooking this tasty Greek cuisine seafood dish! Preparation: If the octopus is fresh, as mentioned, you need to tell your fish store to prepare it for you, as the head sack must be cleaned inside. The frozen octopus doesn’t require that. Cut the octopus in two pieces, between the head and the arms. Cut and discard the small middle part between head and arms, where the eyes and mouth are located. You only need to keep the clean head sack and the arms. Next, cut the head in two pieces and clean it from any internal membranes may have been left. Then cut the arms in four pairs. Put the octopus pieces in a pot, on medium to high heat (image 1 below). It will start losing moisture, and you will notice some water in the pot. Stir for a few minutes until it dries out and changes color (it turns pinkish). At this point, add the olive oil (image 2 above); stir and add the onion (image 3 above). Cook until it gets translucent. Then, add the garlic and continue to cook for another 2-3 minutes, stirring continuously. You may notice sometimes residue, left from the octopus, on the bottom of the pot at this point. You can deglaze that using a wooden spatula in the next step, so no worries here. Mix the tomato paste and the grated tomato and empty the bowl in the pot, adding the bay leaves, the allspice berries, the cloves and the water as well. Reduce the heat to medium-low and start deglazing any residue from the bottom of the pot with the spatula. It will come off fast. Let the pot simmering, and cover half of the it with the lid. Stir occasionally, more often when the sauce starts to thicken. Cook until the sauce is thick, then remove from the heat. For the rice  Put the rice in a bowl with water and let it soak for 30 minutes. Drain before using it. Pour the water in a small pot, adding the rice, the stock cube and the salt. Put it on high heat. Once the water starts to boil, reduce the heat to low and stir carefully from time to time. The rice is ready once the water is absorbed. Serve the octopus with the rice as side dish. Kali oreksii!! 1. If you like some extra flavor, you can also add 1/4 cup (125ml) of wine vinegar, after adding the garlic and let it evaporate before adding the tomato. 2. It’s better if to use a non-stick pot for the recipe, to avoid stickiness of the octopus on the bottom. Enter your email  and get more authentic recipes like this, as soon as they're published; directly in your mailbox.